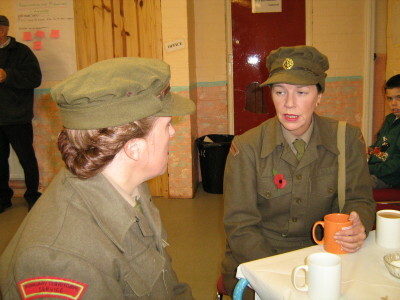 I was in The South Lancashire Regiment which was based at Streatlam Camp 1955 - 1956. The Regiment moved to Berlin in 1956 exchanging with the Cheshire Regiment. So the Cheshire's were stationed here at least twice. Your site lists 1949. Was there an Army cinema outsde the gates at Strealam or is my memory playing tricks? 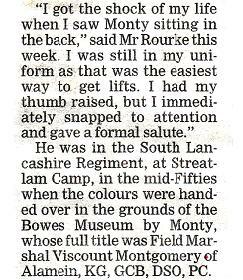 I served with the South Lancashire Regiment and was stationed at Streatlam Camp 1955/56. 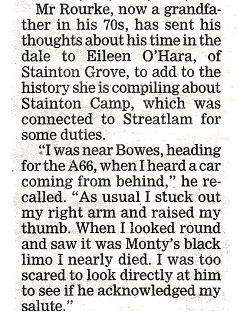 There are many memories of this period in my life most of which are personal and in no way historic but I thought I would share a few. I remember well a group of regular soldiers being demobbed shortly before the 1956 Suez Crisis and signalling their undisguised hatred of the Regimental Police has they passed through the camp gates. They of course used the fingers of both hands to illustrate their feelings but somehow forgot they were committed to seven years as reservists! A couple of weeks later they were all back when the Crisis meant their recall and to greet them were the very same Regimental Police. You can imagine the reaction of both sets of men and the ensuing weeks of reconciliation! We National Service men thought it was hilarious. 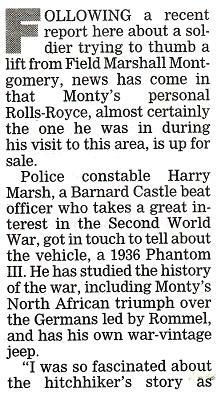 I used to hitch hike home to Manchester at every opportunity and on the day that Field Marshall Montgomery presented the Regiment with new colours at Bowes Museum was one of those occasions. 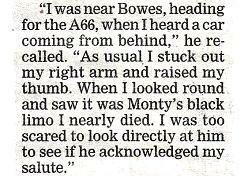 I was on parade that morning and after the presentation made a hasty dash for the A66 and as usual started "thumbing any private car going in my direction" sometimes without noticing if the cars were full. The next section of this story seems like fantasy but it is true! While trudging along the road I heard a vehicle coming and instinctively stuck out the thumb. 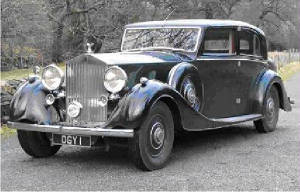 Lo and behold I had thumbed a black limousine carrying the Field Marshall! 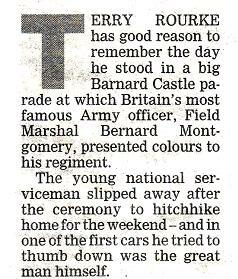 That thumb rapidly became a full hand as I sprung to attention to salute him. These hitch hiking journeys always resulted in a return train trip back to Broomielaw station and to this day I can still hear the Station Masters voice in the early hours of a Monday morning. Most of us on the train would have been asleep or at least dozing and we would be awakened by the eerie call in the darkness of "BROOMIELAW"
I have been back to Barnard Castle on quite a few occasions since those days, once seeing Streatlam camp being dismantled and once failing to see a single trace of where it was. I searched for the railway station location but forgot about Doctor Beeching's destruction of a system we will soon need again. I nearly stayed at The Golden Lion on one occasion. 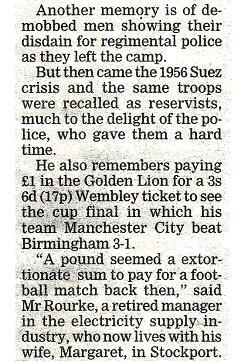 A pub where I purchased a ticket for the 1956 FA Cup Final, paying £1 for a 3/6d terrace one. Another everlasting memory was spending one of the coldest winters of my young life in the sports store and hanging out a row of battalion football shirts after washing them. I forgot all about them until next morning and they were absolutely rigid the next morning! I can see them now as we stood them on their tails in the store to thaw them out - eleven shirts now with their sleeves in an upright position. 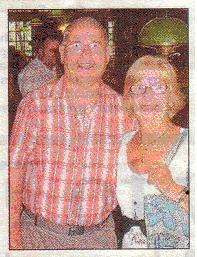 If only we had taken a photo of them!